"In 1989, at the age of 37, I began to have severe back pain, high fevers and nausea that would cause me to lie in bed for days. I curled up in bed, attempting to take deep breaths as sharp pains shot through my body and fevers made each muscle ache. I was shortly diagnosed with kidney stones and a urinary tract infection where doctors put me on Vicodin and antibiotics. Despite the pain medication, I continued to suffer from abdominal pain, stiff neck, lower back pain, spinal disk trouble, fluid retention, heel spurs, weight gain, fuzzy eyesight, and hair loss. Unfortunately, the stent only lasted a few weeks. I had so many stones that even the stent backed up causing additional pain. Even worse, the doctors felt my condition was so severe that they denied me as a candidate for a kidney ureter transplant. They felt that my kidney problems and the massive amounts of sludge would cause scar tissue and ruin any transplant within a year. It never got better, even though they continued to switch pain medication with Methadone. Soon, all I could do was crawl off the couch to go to work and crawl back in bed as soon as I got home. Working as an admitting clerk at a hospital, who usually handled thirty or so patients a day, I became exhausted. Every ten minutes or so I would have to get up in-between cases and either use the bathroom or sit and cry due to the pain. Several times I buckled over while trying to help a patient and co-workers had to close the booth down as I crashed out on the desk in agony. My friends watched me for the next three years go from being a social butterfly to an anti-social outcast hiding in a dark room, unwilling to open the blinds. Eventually, I no longer wanted friends to visit and I just wanted to lie there alone hoping the medication would knock out the pain and allow me to sleep through the entire experience. Sleeping all day eventually led to a severe depression. I have always been known as the fun, positive comedian to all my friends, but the pain even wiped out my positive spirit. My family was so concerned, that they motivated me to start seeing a therapist. I later realized that pain has a major impact on mental stability and two-thirds of all people committed to mental institutions suffered from kidney problems BEFORE the mental illness. Clearly, I was not alone. I tried his new KGP Flush formula on September 20th, 2007. Immediately I liked the taste, especially when mixed with fresh pressed apple juice, and told myself that this would be an easy kidney detox to do for seven days. Within 8 hours, I could tell something was happening in my kidneys. I had a little bit of nausea on the first day, but it went away by the second day. By the third day, ALL my kidney symptoms— abdominal pain, lower back pain, and painful urination—completely dissipated. The most AMAZING part is that I had a release of major pressure in my lower back and right kidney, which is the first time I have ever noticed even a slight release in over ten years. When I went to the bathroom, I could actually urinate with ease and I never had to strain (this is common because kidney sludge inhibits regular flow). I also had no burning! All of this was so shocking I held my breath hoping that this pain relief would continue. By the fourth day, I stopped taking my evening does of pain medication and noticed for the first time in over ten years, I had no pain. By the sixth day I was overwhelmingly amazed at how fast this formula had worked, and how it already had drastically changed my life. Now, two weeks into the cleanse, I can report having no pain and no need for evening pain medication, the pressure in my low back is completely gone, my energy levels are through the roof and my urine flow is back to normal! 2 months later, I can report holding strong even after the one round of this kidney detox! I still do not have need for my evening pain medication, my urine flow has remained normal, pressure in my lower back has never returned and my energy levels continue to climb. Jon Barron is a lifesaver and I am so grateful for his dedication and the research he did to create a formula that could help my life and all the other thousands of people who are enduring the same excruciating pain. This formula is so tremendous that I only wish I could have had this product years ago. Thank you Jon Barron and the staff at Baseline Nutritionals®!" November 2009 Update: I continue to perform a kidney detox 4 times a year and I am delighted to report that I have absolutely no kidney pain, no burning, no sand and no blood in my urine. After being on chronic pain medications, vicodin and methadone, consistently for 12 years, I am now amazed that I do not take a single dose! I just want to say thank you. 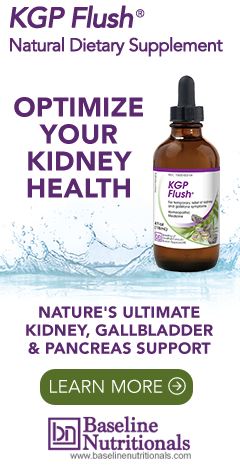 The KGP Flush product is a Godsend. I have been dealing with kidney stones since 1997 and this latest one is the largest one I have had at 12 mm. I had the lithotripsy done and still have a stent. I was in such pain from the stent and felt like my kidney was bruised from the procedure. Within an hour of taking the product, no more pain! I can walk now without the cramping of the stent. I am hoping the continued use of this product will prevent future stones. Your story is so motivational and I am sure people will inspire from your amazing story. Thanks for sharing!